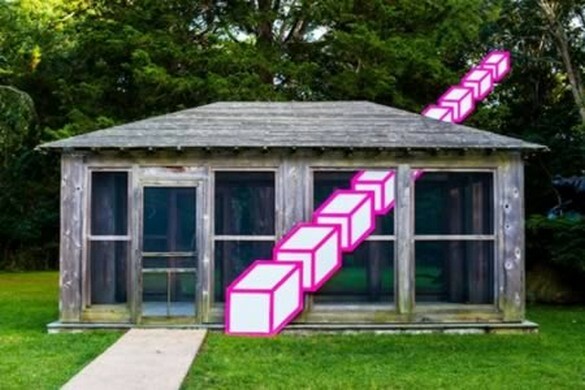 Optical Illusion by Aakash Nihalani. Nihalani is an American artist based in Brooklyn who uses tapes in bright fluorescent colors to create real optical illusions based on geometric shapes. This Tehran building mural is so well-executed that I had to take a moment to digest that it was a work of art and not some impossible, kooky architectural design. 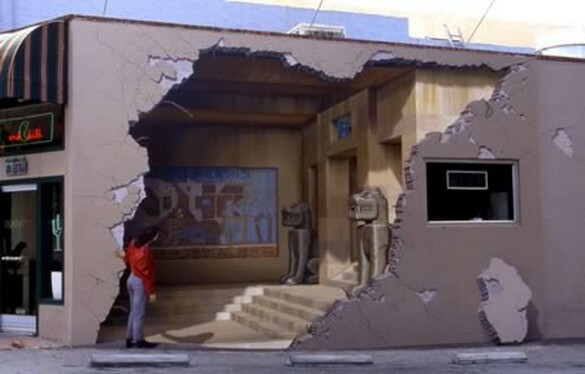 Located in Iran, this piece cleverly relies on an optical illusion that will have the residents doing double-takes. Building work is going on the corner of the Portland Street and Charlotte Street block in Manchester. 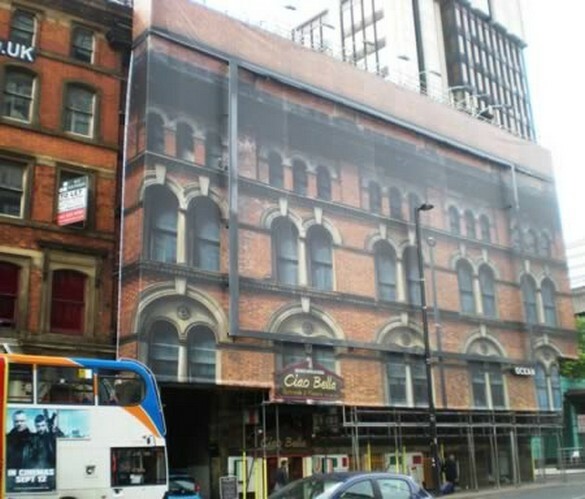 Instead of scaffolding protected by plastic sheets, technological advances have led to giant photo montage reproductions of the actual building being renovated underneath. Shop signs are then mounted on top, as we see here with the Ciao Bella and Ocean restaurants. This also goes around the corner where there is a giant advertisement hoarding the top of the mural, which is a shame. 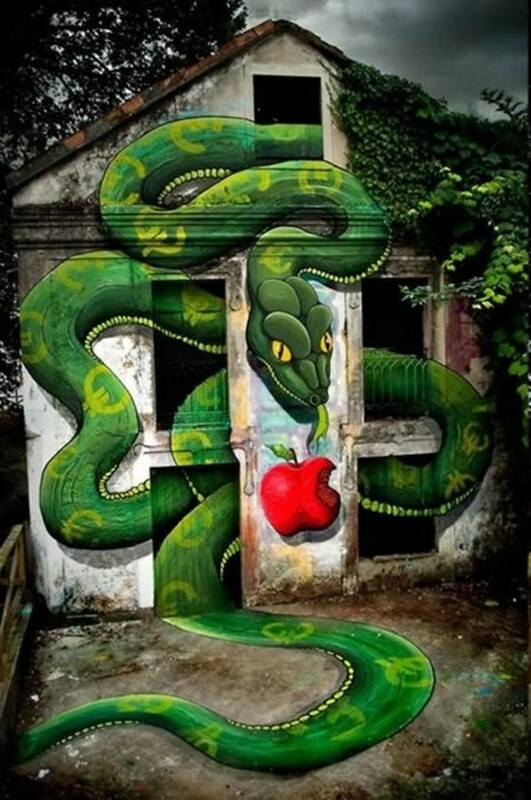 This painting entitled “Original Sin” was created by SOKRAM for the DesOrdes Creatives Festival in Ordes, Spain. He effectively used the structures of the building like the doors and windows to create an illusion of depth in the painting. At first glance, it looks like an earthquake destroyed the walls of this building. Amazingly, it's just an optical illusion - even the woman looking inside is fake. 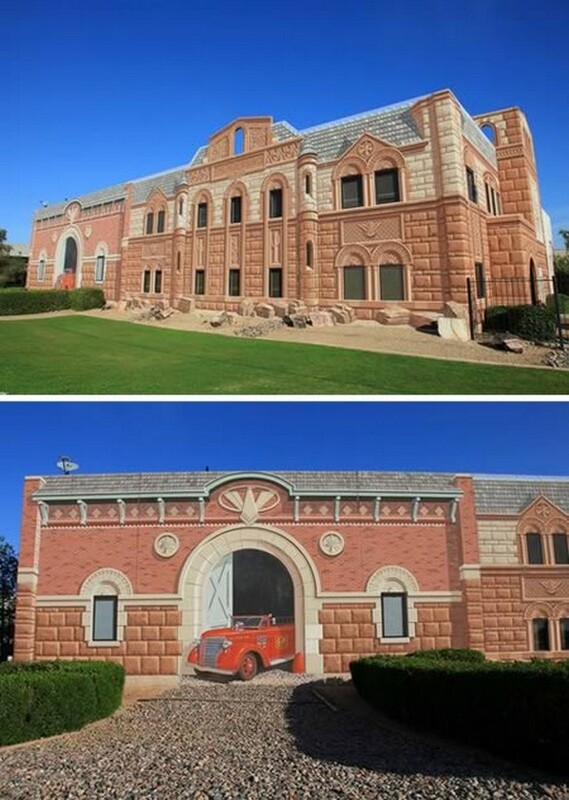 The paintings, which have fooled many, were created by Californian-born artist John Pugh, who specializes in trompe l'oeil or "trick of the eye" art. He works on large scale murals in public and residential areas and his paintings can be seen all over the world from New Zealand to Hawaii, with many telling a story of the area where they are positioned. 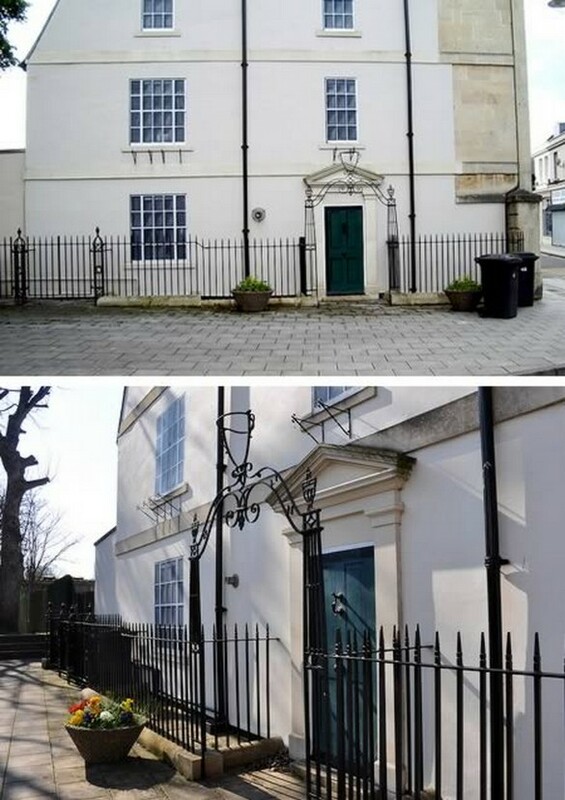 Would you believe me if I told you that this fantastic portico doesn't really exist! 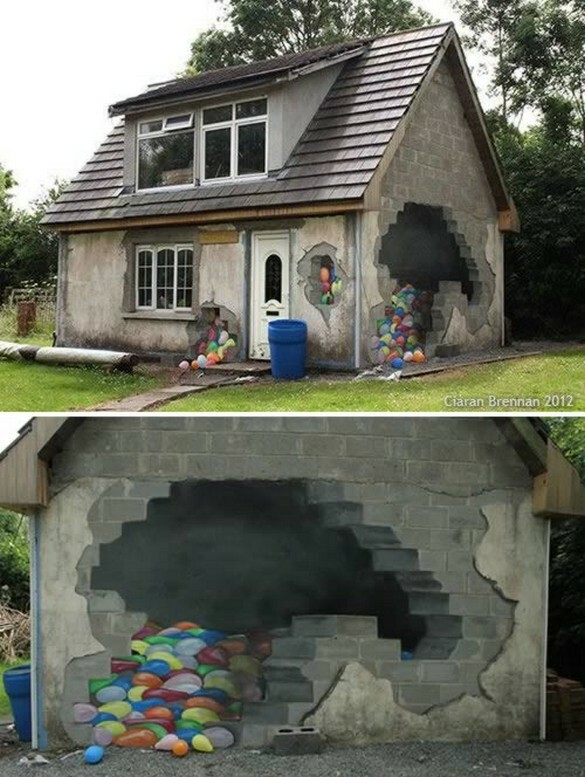 It's “just” a mural, and what a mural, I must say! 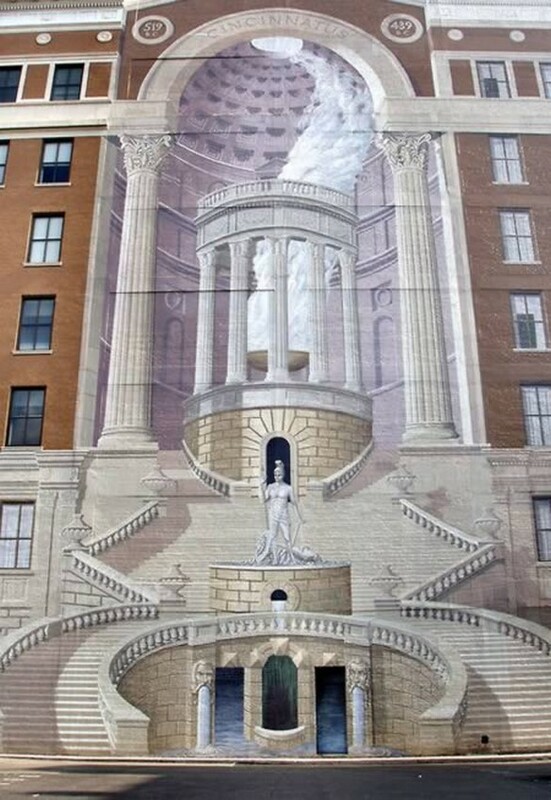 It was painted by an artist named Richard Haas on the facade of the Brotherhood building in Cincinnati, Ohio in 1983. This mural is a real example of trompe l'oeil (“to deceive the eye”) or faux finishes, as some call them. The building was designed by American muralist Richard John Haas in 1985. His murals have been commissioned as decoration for numerous public buildings in the United States. These include Chase Field, the Robert C. Byrd Federal Building & Courthouse in Beckley, West Virginia, the main branch of the New York Public Library, the Lakewood Public Library (Ohio), the Sarasota County, Florida Judicial Center and the former Board of Education building in Brooklyn, NY. One of his most renowned works, "Brooklyn Bridge," couples his artistic genius with his architectural background. 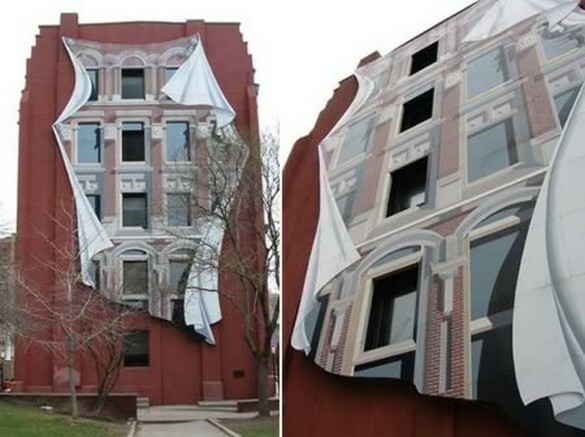 Trompe l'oeil is a visual illusion, often painted on the plain side of a building. You think what you are seeing is a three-dimensional scene. This example was photographed with a Pentax Optio S30 during June, 2005 on Roundstone Street, Trowbridge, Wiltshire. In Lyon the walls tell stories, mostly very tall tales. While painting on walls is as old as time, the city has taken the art of modern urban wall painting to new heights with nearly 60 outdoor murals. 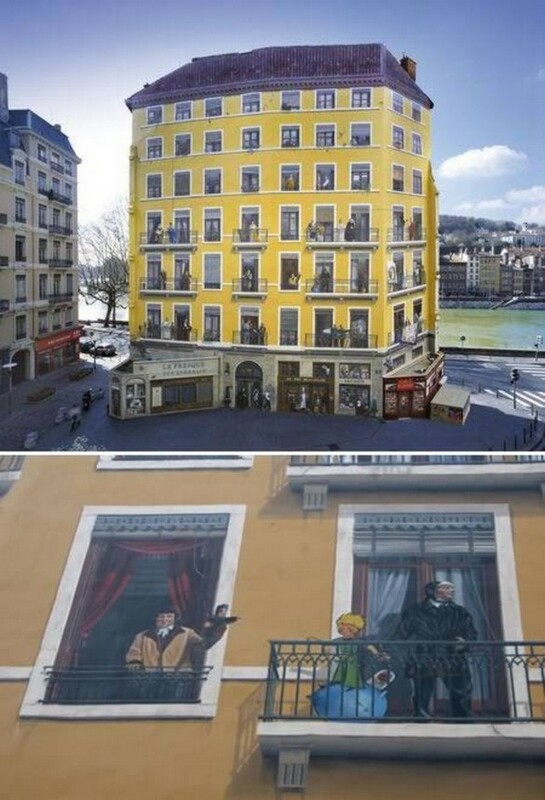 Some are breathtaking flights of fancy; others are marvelous examples of trompe l'oeil, depictions of everyday life so realistic you could almost walk into them. 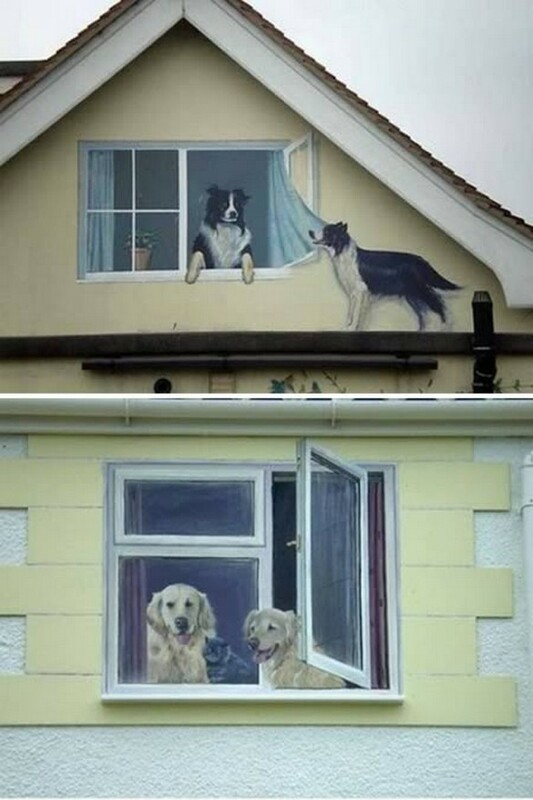 Interesting paintings on the facade of a house creating the illusion of windows with animals.